and stand a chance win back your spendings in the $30,000 Grand Draw and receive a guaranteed cash back of up to $100! Plus, one lucky couple will walk away with a vacation to Club Med Kani in Maldives (worth $8,000)! The promotion is valid from 15th Oct 2018 – 30th April 2019. Blackout dates: 1st - 6th January 2019. * If your preferred package is not listed on the premium vendor's profile, kindly contact the vendor via Message or select "Pay to Vendor" on the profile. Entries will be closed on 30th April 2019, 11.59 pm. The Grand Draw broadcast date will be announced shortly. Good luck! 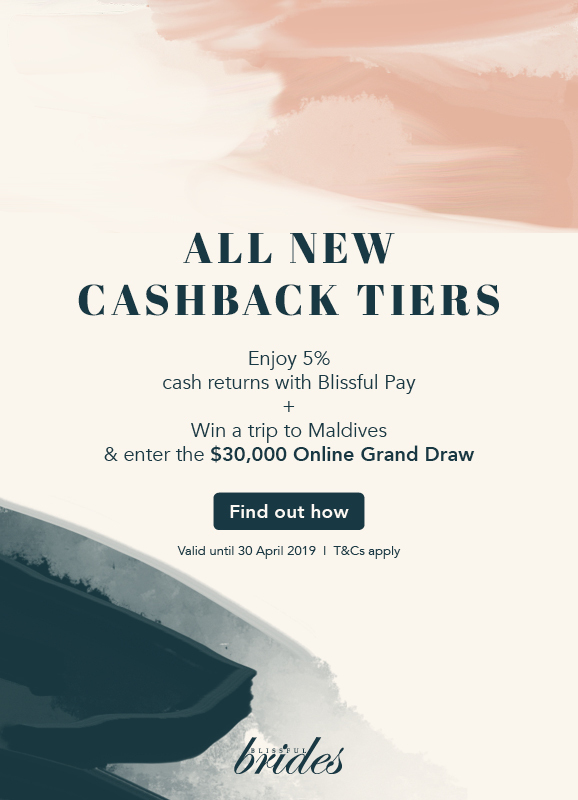 * New cashback tiers are valid until 30th April 2019. This online cash back is organized by Citrus Media Pte Ltd. (“Citrus Media”). The cashback is open to all registered Blissful Brides online platform members (“Members”). The cash back is valid for confirmed orders that are paid online via www.blissfulbrides.sg (“Blissful Brides Portal”) between 15th Oct 2018 to 30th April 2019 ("Promotion Period"). Any purchases and payment made during the blackout dates of 1st January 2019 to 6th January 2019 will not qualify for the cashback. Members are required to make a purchase from any of the premium vendors and make their payment online via Blissful Brides Platform to qualify for the cash back. The cashback is applicable on the first initial deposit on the first package purchased within the Promotion Period. Subsequent purchases and payments will not be eligible to claim the cashback. Each NRIC is eligible to claim ONE cashback in the promotion period. Each package is entitled to ONE cashback claim. Multiple payments for the same package under different usernames and NRIC will not qualify for the cashback. The cashback will be based on the spending tiers stated below. Successful entries will receive an email notification on the redemption dates to collect the cashback within one month upon payment confirmation. Collections will be held at Citrus Media office at 87 East Coast Road, #02-01, Singapore 428789. This online lucky draw is organized by Citrus Media Pte Ltd. (“Citrus Media”). The lucky draw is open to all registered Blissful Brides online platform members (“Members”). To qualify for the online lucky draw, Members have to purchase a package from any of the premium vendors and make their payment online via Blissful Brides Platform between 15th October 2018 to 30th April 2019, 11.59pm. Any purchases and payment made during the blackout dates of 1st January 2019 to 6th January 2019 will not qualify for the $30,000 Grand Draw. Qualified orders will automatically enter in the Blissful Brides $30,000 Grand Draw. A separate submission is not required. Members are required to notify the vendor of their payment prior to submitting the payment on www.blissfulbrides.sg. In the case of multiple payments made for a single order, eligible entries will be based on the amount shown on the individual payment transaction. For example, if a couple paid $1000, $1500 and $2000 for the same order, the prize amount will depend on the winning entry that is drawn. Total cash rebate amount will be deducted according to drawn amount until it has fallen to zero. The number of winners will be determined by the amount spent by the respective winners. The lucky draw will be conducted through a LIVE broadcast on Blissful Brides Magazine Facebook page, date to be announced shortly. Winners will be announced and contacted via the submitted mobile number upon entry submission. Winners are required to provide an answer to a question which will be displayed during the LIVE broadcast on Blissful Brides Magazine Facebook page. An instant response is required to claim the prize within a stipulated time. Thereafter, Citrus Media reserves the right to forfeit the selected winner and redraw. Citrus Media will not be responsible for entries with incorrect contact information submitted. Winners must collect their prize at Citrus Media with their original NRIC within the specified collection period and agree to offer their assistance and presence for any upcoming follow-ups regarding the cash rebate including video interviews. Citrus Media reserves the right to amend and disqualify eligible entries which have been suspected of breaching the terms and condition. Members are deemed to have accepted and agreed to be bound by these terms and conditions upon submission of an entry for the online lucky draw. By participating in the online lucky draw, participants agree and acknowledge that all personal data submitted may be used by Citrus Media and its affiliates for marketing purposes.